The saint whose name leads all the rest who have sacrificed their lives for Jesus Christ is Stephen, the first martyr of Christendom because he would have been the last to deny him. 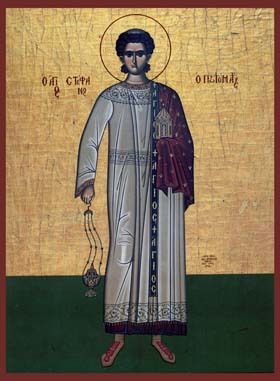 Stephen was one of the seven deacons of the original Church of Christ in Jerusalem, sharing his duties with six others - Philip, Prochoros, Nikanor, Timon, Parmenas, and Nicholas. It was the function of the deacons to assist much as they do today in such matters as communion but with the additional responsibility of spreading the new faith and at the same time being ever on alert for the imminent danger that came with being a Christian in those early days. Before entering the service of Christ, the young Stephen had studied under the renowned rabbinical tutor Gamaliel, who had been the mentor of the great St. Paul. Not unlike Paul he was a qualified religious scholar who once sought to discredit the Saviour, until he came to know Jesus Christ and to embrace him as Paul did in that dramatic confrontation on the road to Damascus. The full attention he had been giving to the Law of the ancient covenant he now directed to the new faith with zeal equal to that of those who enjoyed the company of the Messiah. There was no hint that he would be the very first casualty in the cause of the Nazarene, but each and every one of the missionaries was aware of the danger involved and chose to ignore it in their anxiety to serve. Stephen seems to have confined his missionary work and preaching to the city of Jerusalem, the city in which he had prepared himself under the Pharisee Gamaliel for quite another career. Well versed in the Scriptures, he used the Old Testament to full advantage in promoting the Messiah, citing the passages that were ample evidence out of the mouths of the ancient prophets of God that a Saviour would be born and that the Saviour was among them even now in the person of Jesus Christ, the Son of God. It was with considerable anger and frustration that the men who had studied with him under Gamaliel now viewed the defector from their ranks, being particularly piqued when Stephen boldly challenged them in the synagogues. He must have done this several times and, in all probability, been unceremoniously ushered from the premises more than once, but there came an occasion when he addressed himself to an extremely hostile Council of elders whose anger drove them to more than just having Stephen put out. The mob that turned on Stephen worked itself into such a feverous pitch that by the time he had been seized and dragged into the street a cry went up for his blood and grew into a crescendo demanding his death. Dragged to the gates of Jerusalem and stoned him to death. The gallant young Stephen died a brutal death at the hands of those with whom he had grown up. In the Book of Acts there is an account that Paul was among the onlookers who made no effort to save Stephen. The early Christians buried Stephen in a small chapel in Jerusalem which was dedicated to his memory and was known as the chapel of St. Stephen the Protomartyr (First Martyr).